Hi! Today I'm wearing another of my all black outfits. I am wearing a fur vest over a leather jacket, with patterned leggings and simple heels. Olá! Hoje estou a usar mais um conjunto todo preto. Estou a usar um colete de pêlo, um casaco de pele, umas leggings com padrão e uns sapatos de tacão simples. I just realize you've moved to blogspot, I'm already following you guys here! love the new look of the blog! About the outfit, wow, want those stunning pants! You look amazing, and also, the red lips look great on you, pretty! Thank you for following us and your sweet comment! Lovely blog!I'd like to follow each other..so I'm following you now! Lovely and very chic outfit!!!! Thank you Vikee! Keep in touch! Beautiful! I adore your vest! great look darling! you look very classy! Loving the all black outfit. Coming from a generally bright sunny country (New Zealand) I'm always too shy to wear all black - it seems too stark. But you look fantastic - I may yet try the all black look. Thanks for the follow Estefania! ADOREI o vosso blog e o vosso estilo... já vos sigo de volta :)!!! Thank you Jessica :) We are now following you! 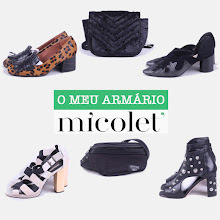 Vocês têm looks bem giros...gostei do vosso blog! Também já vos sigo! Tenho umas leggings iguais eheh .. são mesmo lindas! Thanks Milex! Loved your blog! Love this simple yet so chic outfit! Your ideas of sharing a blog is really nice! Me encanta tu look, es perfecto! !